One Easy Recipe, Two Tasty Pumpkin Snacks! One easy recipe, two tasty pumpkin snacks! 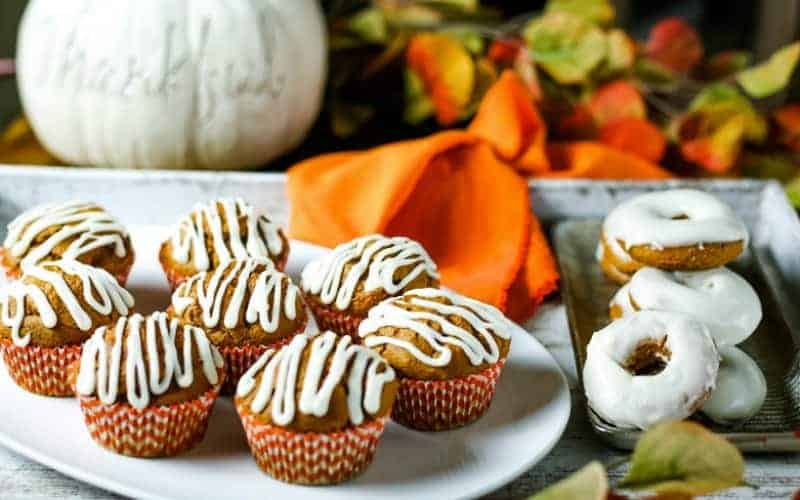 Make either pumpkin spice muffins or pumpkin spice donuts from the same batter and finish them off with a cream cheese drizzle for a yummy Autumn treat. Confession: I am one of those people who gets super excited when Starbucks makes the announcement that the Pumpkin Spice Latte has returned to the menu for the Fall season. That’s a pretty big swing from a 10-year-old kid who would never even taste pumpkin pie at Thanksgiving. I’m so glad that I out grew that phase! 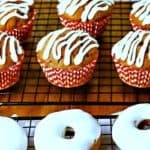 Bring on the pumpkin lattes, the pumpkin pie, and these EASY Pumpkin Donuts and Pumpkin Muffins! 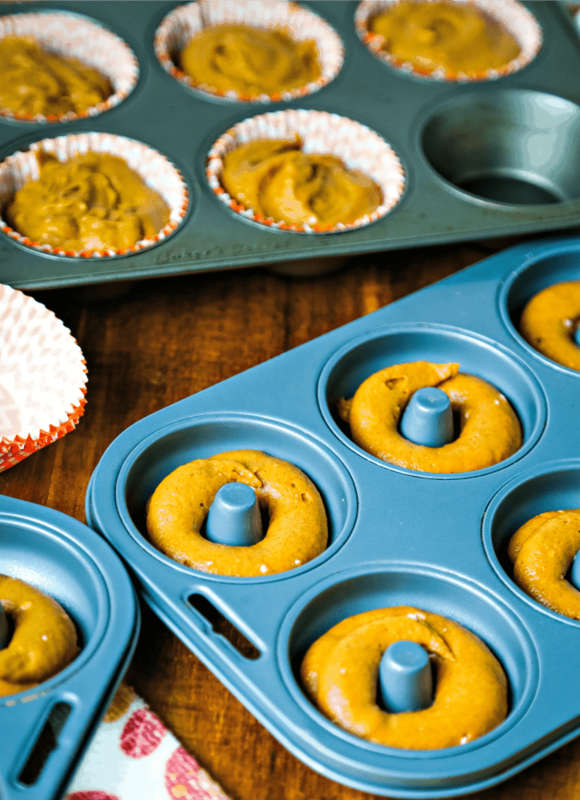 For the last couple of years, I’ve been seeing the short-cut recipe for pumpkin muffins using a boxed cake mix and canned pumpkin, but did you know you can also use this same recipe to make baked pumpkin donuts? This batter literally only requires three ingredients—spice cake mix, pumpkin puree, and eggs! If you’re looking for a quicker homemade snack, you can skip making the glaze and serve them straight from the oven. They’re tasty either way! This recipe will make 14-16 muffins or 20-24 mini donuts. I decided to split up the batch and ended up with 9 muffins and 12 mini donuts. I have two of these non-stick donut pans and love them! Depending on whether you’re feeling like donuts or muffins, lightly spray the donut pans with cooking spray or use paper cupcake liners sprayed lightly with cooking spray in a muffin pan. 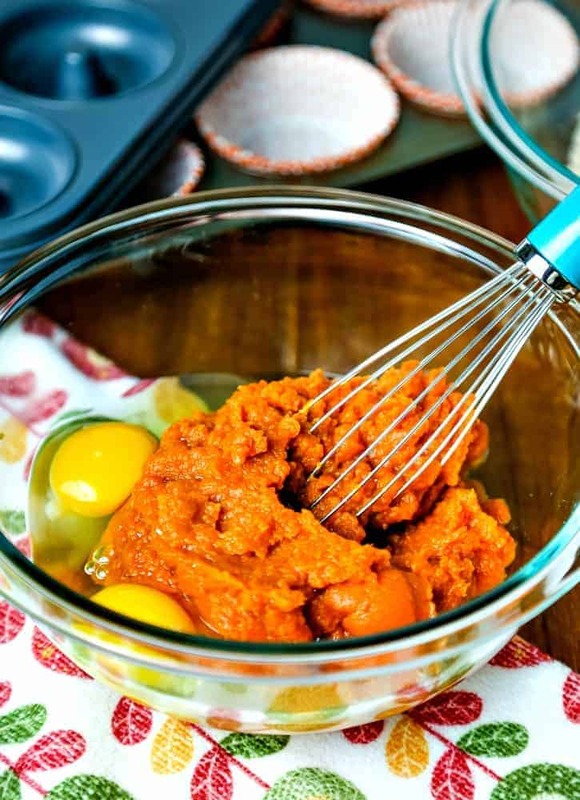 Next, combine the two eggs with the can of pumpkin in one bowl using a whisk to mix it all up. 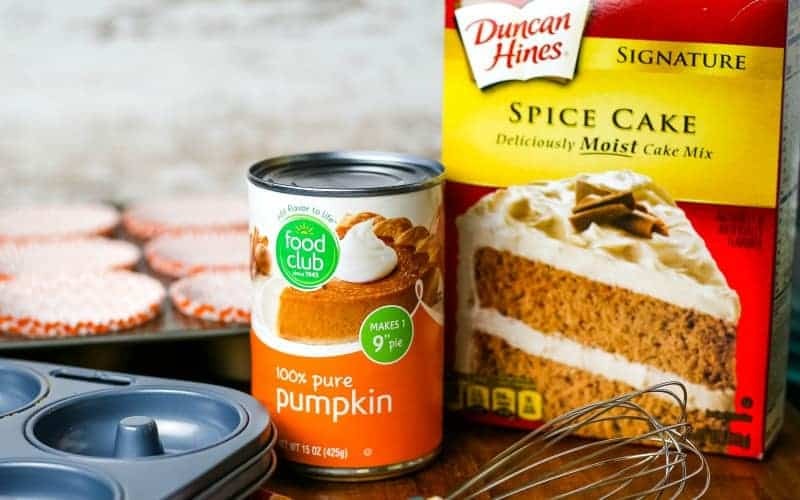 Stir the pumpkin mixture into the dry cake mix using a spatula or wooden spoon until the dry cake mix is absorbed and no pockets of dry mix remain. Next, spoon the batter into the muffin cups until they are almost full. Baking the muffins at a high temperature (400 degrees) will help them rise quickly. The easiest way to fill the donut pans is to use a piping bag with a large tip or to use a ziplock bag with the corner snipped off. The donuts will also rise, so only fill the pans about half full. Muffins should bake 15-18 minutes and donuts should bake 7-8 minutes at the same temperature. Add the glaze and you’re done. How easy is that?! 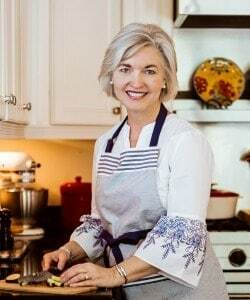 Follow my Pinterest board, Festive Fall Food, for hundreds of apple and pumpkin recipes I’ve curated from across the web! One easy recipe, two tasty pumpkin snacks! 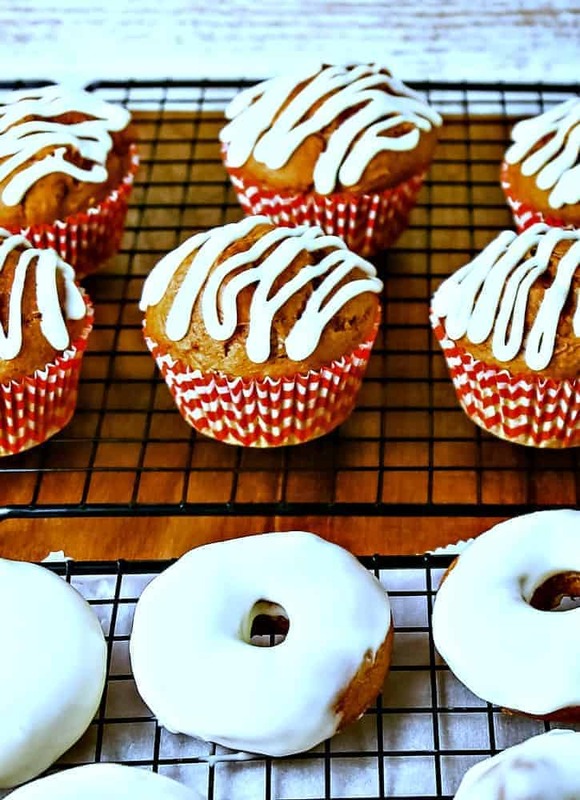 Make either pumpkin spice muffins or pumpkin spice donuts from the same batter. Finish them off with a cream cheese drizzle for a yummy Autumn treat. Preheat oven to 400 degrees. For muffins, line muffin pan with paper muffin cups and spray lightly with cooking spray. For donuts, lightly spray a non-stick donut pan with cooking spray. Recipe will make 14-16 muffins or 24-30 mini donuts. Pour dry spice cake mix into a large mixing bowl. In a separate bowl, stir together the pumpkin puree and eggs until combined. 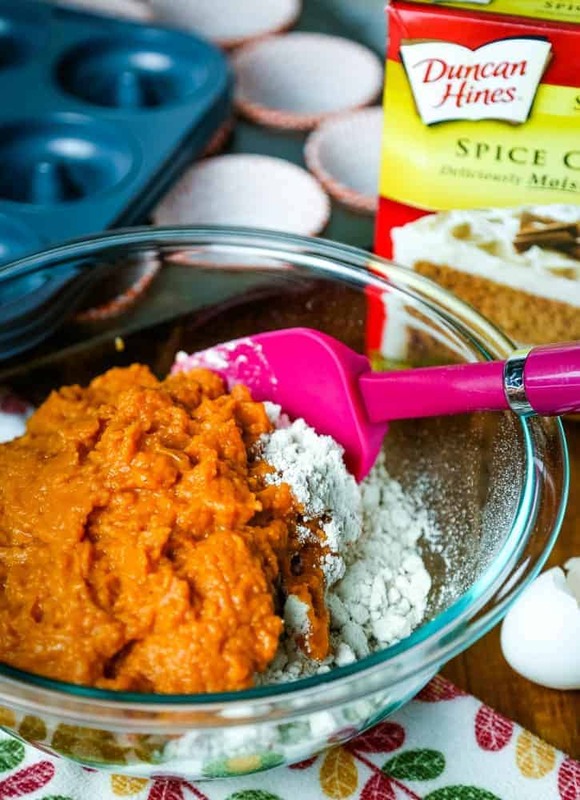 Pour pumpkin mixture into the bowl with the cake mix and mix until all the dry ingredients are incorporated. For muffins, fill the muffin cups to the top. For donuts, place batter (two cups at a time) into a large ziplock bag. Snip off the corner and pipe the batter into the donut pans. Bake muffins for 15-18 minutes or until a toothpick inserted into the center of a muffin comes out clean. Bake donuts for 7-8 minutes. 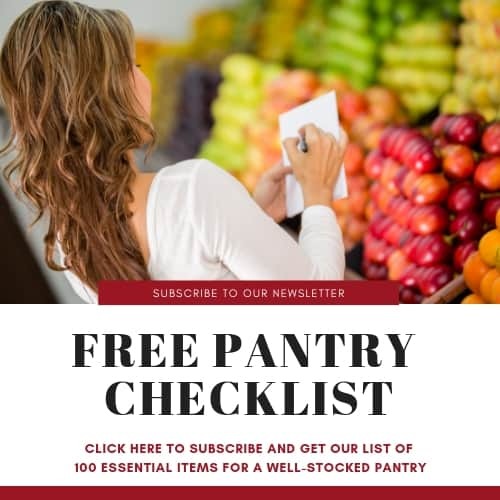 Remove muffins and donuts from pans and allow to cool on a wire rack. Beat softened cream cheese and butter with a hand mixer until creamy. Add vanilla and powdered sugar and mix on low until combined. Add milk a tablespoon at a time and mix until the desired consistency is obtained. Drizzle glaze over muffins and donuts or dip donuts in the glaze to cover completely. Allow to dry. Refrigerate until ready to serve.